Eastern Asia is a large part of the world that includes China, Japan, Mongolia, North and South Korea, and Taiwan. Much of these areas are covered by harsh terrain, including distant mountains, massive deserts, and parched grasslands. Eastern Asia also has many valleys, plains, and fast flowing rivers. China is one large part of Eastern Asia. 80 percent of China’s 1.4 billion people live in the countryside and farm on the land. In Chinese cities, housing is hard to find, so people live in crowded conditions. With the world's largest population, Chinese citizens often struggle for food and education. 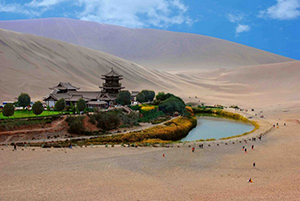 Eastern Asia also contains the Gobi Desert, the world’s fourth largest desert, which is unusual among other deserts because it has hot summers and cold, icy winters. Bactrian camels, whose home is in the Gobi Desert, have adapted to the harsh winters by growing thick coats that they lose come spring. The Gobi Desert is also home to the fossils of dinosaurs who lived there 85 million years ago. One landmark many people know about in Eastern Asia is the Great Wall of China. Some might not know that China actually had four walls. The four walls were built to protect the country from invasions by the Mongolian people who came from the north. The first wall of China was built by the first Chinese emperor, Qin Shih Huang -ti. The second and third walls of China are very similar to each other, but were placed in opposite directions. The fourth wall, is the one many people are familiar with, the Great Wall of China. These are just some examples of the many things to learn and discover about Eastern Asia. There is so much more that one can learn about these great lands!